Implementation of Singleton design pattern. Why Singleton class is a static class. Lazy loading and Eager loading. Difference b/w Static class and singleton class. This is very popular creational design patterns which restrict us to have an instance of a class. Note: A singleton class can't have a public constructor and it has to be sealed. 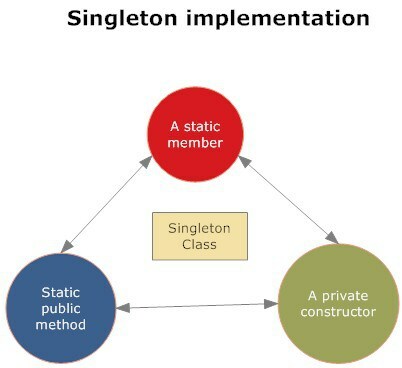 The entry point to get the singleton instance would be a static method or a static property. In above diagram we will see different objects trying to invoke an object instantiated as singleton. This single instance of the object is responsible to invoke underneath methods or events. This in this we created a function to print and a static variable to check that how many instance is creating or this class. Above image we can see that its counter value is incrementing as much time we are calling to this class it means it’s creating the instance 2 time for “singleton” class which is not the rule of singleton design pattern. Now make some changes in “singleton.cs” class and” program.cs” class. Now we can see that counter value is not incrementing as much we create the object for that class and this example follow the rule of singleton design pattern. This can be a question arise in our mind that when we have private constructor in singleton class then what is the need to make that class as Sealed class. Lets create a class name “DerivedSingleton” and Inherit the singleton class ,it will give compile time error that Singleton is inaccessible due to its protection level, Because singleton is private class. * This violates singleton design principles. We have remove sealed keyword from the class that why we are able to inherit . * Instantiating singleton from a derived class. This violates singleton pattern principles. This violates the principle of singleton. Let’s go back to the Singleton and make the class as sealed and remove the DeriviedSingleton class. Lazy Initialization : The lazy initialization of an object improves the performance and avoids unnecessary computation till the point the object is accessed. Further, it reduces the memory footprint during the startup of the program. Reducing the memory print will help faster loading of the application. Lazy Initialization in our example : GetInstance Property is responsible for the Singleton Instance creation. Singleton object is not instantiated until and unless GetInstance is invoked. Hence, there is a delay in instance creation till the GetInstance is accessed. This Delay in Instance creation is called Lazy Initialization. Basically Lazy initialization work fine in single credential environment. In other case suppose that if multithreading are invoking same getinstance property at same instance of time then their chance that it create multiple instance for this property. Here System.Threading.Tasks.Parallel.Invoke is a static method which is given by the Microsoft to invoke multiple method parallel. Now run your application you will see that this issue is resolved. How to implement a Thread Safe singleton class : Locks are the best way to control thread race condition and they help us to overcome the present situation. Please refer to the Singleton.cs code for lock checks and double check locking. Non-Lazy or Eager Loading : Eager loading is nothing but to initialize the required object before it’s being accessed. Which means, we instantiate the object and keep it ready and use it when we need it. This type of initialization is used in lower memory footprints. Also, in eager loading, the common language runtime takes care of the variable initialization and its thread safety. Hence, we don’t need to write any explicit coding for thread safety. Singleton with Lazy keyword (.NET 4.0) : Lazy keyword provides support for lazy initialization. In order to make a property as lazy, we need to pass the type of object to the lazy keyword which is being lazily initialized. By default, Lazy objects are thread-safe. In multi-threaded scenarios, the first thread which tries to access the Value property of the lazy object will take care of thread safety when multiple threads are trying to access the Get Instance at the same time. Therefore, it does not matter which thread initializes the object or if there are any thread race conditions that are trying to access this property. 3. Reduces the memory footprint on the start-up. Now assume a situation that we need to assign some static property in the singleton class and those property need to be retrieve from the database ,in those situation we use last initialization as we do not need to retrieve these values till the singleton object is initialize .